This website is an unofficial and non-commercial fansite for the Seventies' cop drama The Streets of San Francisco. It was originally set up not long after the first set of official DVDs was released. Following a period of inactivity, this site was officially re-launched on July 15, 2013, and the pages are still being added to the various categories. Browse the site using the navigation menu on the top - there are episodic summaries and screencaps, information on filming locations, promotional materials, video clips and a lot more to come. For the latest updates to the website, please check out the recent blog posts below. You may track all updates made to the website and news on the series by checking out the complete blog. Please feel free to get in touch in case of any questions, suggestions or just comments. Season 5 Ep Summaries Added! The short summaries for all season 5 episodes are now added to the episodes' page. I am about to finish the screencapture work and extended summaries plus filming locations information for the final two season 4 episodes, so you can preview the plot of final season's episodes in the familiar shortcuts. As I have mentioned before, most of these short summaries are basically or fully taken from the official Worldvision press kit that was issued with the release of the series' initial video edition. 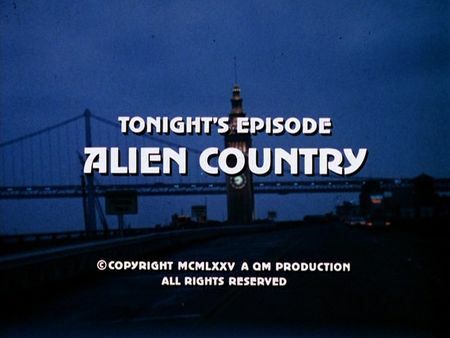 The screencaps for Alien Country are now available on the episodes' page. Extended summary and filming locations info following soon. 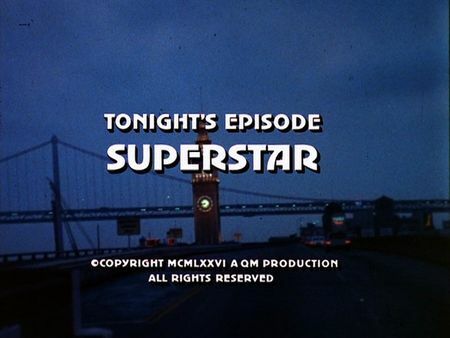 I have just added the screencaps for Superstar to the episodes' page. A cop from Manhattan, Bert D’Angelo - famous for his immaculate arrest and conviction record in New York City - is coming to San Francisco in order to catch an alleged key witness regarding the slaying of his partner, Mickey. Arriving in a club in downtown San Francisco, D'Angelo immediately commences his search for the supposed witness, Joey Latham. Thanks to some information he had received in New York already, D'Angelo's first destination, the Mecca Club bar, is a full hit. But before he can detain Latham (who can escape the scene), however, SFPD cops arrive, taking D'Angelo into custody when they find him threatening Latham with his gun. Mike and Steve are requested to co-operate with D'Angelo, but the New York City cop's abrasive and obnoxious way of dealing with people drives Mike up the wall - whereas Steve is pretty amused. D'Angelo asks them for help - which is granted - but Mike makes clear he is "a guest, just like any other tourist", and he would not take anybody out of San Francisco unless the person wants to go or unless he's extradited, or over Mike's dead body. That being said, the trio tracks down Latham's footprints. D'Angelo's unconventional way and knowledge about Latham's habits ("He's like a brother to me") takes them to the glittering red-light district and Latham's girlfriend, Valery. While Stone and Keller are waiting by the car, D'Angelo can convince Valery to tell him Latham's whereabouts but when they find him, Latham is anything but co-operative in Bert D'Angelo's understanding. Latham confesses he does not have any knowledge about the trap set for D'Angelo's partner, but Bert would not let him go. This demands Mike and Steve to hold him back leaving Latham unchecked. Little does anybody know that the New York syndicate has sent a killer down to San Francisco, Charlie Miller, in order to silence any possible witnesses for the murder of D'Angelo's partner. Miller finds Valery and, subsequently, Joey Latham, and in a scuffle Latham hits Miller's shoulder with Miller's gun but falls out of his apartment's window and dies. Now it's a race against the clock. D'Angelo has pulled ahead after Stone wanted him to get to the airport and on an airplane back to New York. Miller's injury is the key now: he needs medical treatment but cannot go and see a regular hospital or doctor's office. Both, D'Angelo as well as Stone and Keller know that, so they try to find a physician from the New York area whose license was revoked and who is now living in San Francisco. The doctor, Anton Pravek, is found, and although he did not help Miller with his injury, he knows where Miller is located. D'Angelo gets there first, only to find that Miller has left. A circled schedule for ship passages leads him to a freighter bound for Buenos Aires via Los Angeles (the schedule entry says "London Queen" for the ship's name but the actual freighter at the pier is named "Pioneer Contractor"). Being taken by surprise and almost thrown overboard by Miller, D'Angelo is finally saved by Mike and Steve. In the epilogue, Bert comes to see Mike and Steve in their office. Mike is just leaving, reminding D'Angelo he should not miss his flight back to New York City. Bert makes fun with Steve, eventually thinks about moving over to San Francisco, and finally leaves the office with a blinking "Frisco's finest ... but you wouldn't last ten minutes in New York!". This episode is a real fountain of downtown filming locations. Bert D'Angelo (and later Miller) both arrive at San Francisco International Airport, and the production company offers nice landing shots of typical 1970's traffic at SFO, actually. There's quite many locations between Union Square, Tenderloin and Market Street, some more in North Beach and on Telegraph Hill. When trying to catch-up with the sea freighter on which D'Angelo intends to detain Charlie Miller, Mike and Steve embark a US Coast Guard cutter on Yerba Buena Island. It should be noted this particular episode was meant to be the 'starter' for another Quinn Martin crime series, not by chance dubbed "Superstar" and starring Paul Sorvino as Det. Bert D'Angelo who relocated from New York City to San Francisco and "shaking up the town like an earthquake" as a contemporary ABC promotional ad announced. I must admit I have never been that much of a fan of Streets episode "Superstar" since I somehow could not buy D'Angelo's very different character and way of working for the force in contrast to our two cops. In this respect, I was not surprised that the series "Superstar" did not even reach the completion of its first season; ABC discontinued the program early after episode 11. Still, I need to make up my own mind but have not found any source for the series yet. Composer Pat Williams passed away at 79! Another formative figure of The Streets of San Francisco has passed away this week. As Billboard informed on Thursday, Patrick 'Pat' Williams, world-famous musician and composer of one of the most recognizable themes of television history, had died the day before. "The Emmy- and Grammy-winning composer also worked on scores for The Mary Tyler Moore Show, The Bob Newhart Show, Columbo, Lou Grant and The Days and Nights of Molly Dodd. Williams also received an Oscar nod for his work in the 1979 film Breaking Away. His résumé revolves around his role as a major jazz leader - which earned him 19 Grammy nods - and includes a Pulitzer nomination for his jazz quartet and symphony orchestra for An American Concerto." As Variety pointed out in its online edition on Wednesday, "he scored nearly 50 films, often memorable scores for movies that were not big hits, including Casey’s Shadow, The Cheap Detective and Cuba in the 1970s; Used Cars, Swing Shift and All of Me in the 1980s; Cry-Baby, The Grass Harp and That Old Feeling in the 1990s. But his primary occupation was music for television, which ultimately earned him 22 Emmy nominations for such memorable 1970s and '80s series as The Streets of San Francisco, Columbo, Lou Grant, and The Days and Nights of Molly Dodd, and such notable 1990s telefilms as Decoration Day, Geronimo and Kingfish: A Story of Huey P. Long. His miniseries, all in the ’90s and early ’00s, included Jewels, Jesus, Blonde and Hercules. Williams had the most fun in the recording studio, working with top jazz musicians on both coasts to record contemporary big-band albums. His 19 Grammy nominations were mostly for his jazz compositions and arrangements, starting with the landmark Threshold LP and later including albums from his own 1980s Soundwings label featuring saxophonist Tom Scott, trombonist Bill Watrous, and his own big band." I am thankful Pat Williams literally shaped such great and ever-lasting television themes in addition to his remarkable jazz and big-band music. Site re-launch turns five years! Five years have gone by since I took over thestreetsofsanfrancisco.net. The website's contents was still in its very beginnings then, and I tried my very best to keep up my ambitious schedule of one update per week (i.e. either the addition of a complete episode summary plus screencaps or of other new contents such as press release photography, promotional materials and filming locations info). I reduced speed half-way to just one update per two weeks which seemed quite appropriate to me. Thanks for all your kind feedback and inquiries over the past five years; I love to keep in contact with others related to the series in any way. I had to take some time off due to professional and private obligations for half a year, but now it's time to return to the usual rhythm. In a first step, I finally supplemented the summary for episode Clown of Death. Updates will come up every two weeks again. Season four will be completed shortly then, and the fifth and final season is ahead. I would like to take this opportunity to say 'thanks a lot' to fellow Streets fans Liz Edlund and Jonathan Cole who helped a lot with filming location photography over the past five years. The locations section would not be the same without their valuable contributions. All in all: and stay tuned for the forthcoming updates!